Everyone can appreciate the value of accumulating savings in principle. It’s just that it is so hard to do in practice. By the time all the bills have been paid there never seems to be very much money, if any, left over to invest. This is the reason that financial advisors will tell you to pay yourself first. Setting up an automatic transfer to a savings account as soon as your pay check gets deposited each month – even if it is only a small amount -turns out to be one of the most effective ways to build wealth. 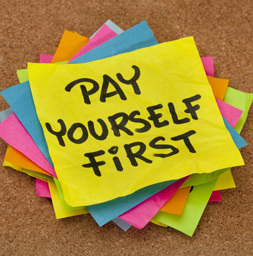 Pay yourself first applies equally well to career development. You may feel that you are barely keeping your head above water at work or school with all the demands on your time and finding extra time to focus on your own development may seem impossible, but it is essential if you want to build a successful and rewarding career. Paying yourself first means making a commitment to set aside time on a regular basis to invest in yourself. This might mean devoting a couple of hours each month, for example on a Sunday afternoon before you get caught up in the whirlwind of the work week, to make a small deposit. An incremental investment to your career capital could include having your résumé critiqued by a professional, joining a new discussion group on LinkedIn, registering for a continuing education course, or sending an email to someone working in a field of interest to request an informational interview. Moving forward in your career by adding to your skill set and your network a little bit at a time on a regular basis is certain to pay large dividends in the future. promotion or dream job will fall from the sky, is like using money you could be saving to buy lottery tickets. Statistically speaking, not a good investment strategy.